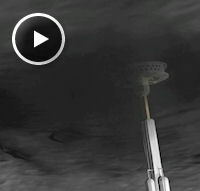 August 16, 2011: In a few years a NASA spacecraft will seek the building blocks of life in a shovelful of asteroid dirt. The OSIRIS-REx1 spacecraft, targeted for launch in September 2016, will intercept asteroid 1999 RQ36, orbit it for a year, and then reach out a robotic arm to touch its surface. "We call it 'touch and go,'" explains principal investigator Michael Drake of the University of Arizona. "OSIRIS-REx will approach the surface at 0.1 m/sec (only 0.2 mph, less than a tenth of walking pace) and, without landing, stretch out its arm equipped with a sample collector. We'll simply agitate the asteroid's surface with ultra-pure nitrogen to stir up material for capture." A YouTube video shows how OSIRIS-REx will approach the asteroid, gather samples, and propel the sample capsule back to Earth. Asteroids appear to be as lifeless as Yorick's skull, yet material captured from 1999 RQ36 could hold clues to life's origin on Earth. Some scientists believe Earth's surface was sterilized2 soon after the planet was formed some 4.5 billion years ago. Planetoids and other debris left over from the genesis of planets pummeled Earth, turning it into a cratered wasteland. The tremendous kinetic energy from the collisions heated Earth to the boiling point. "Earth at 'time zero' had a steam atmosphere that was wrung out to make a boiling hot ocean," says Drake. "Imagine standing on a lava lake in Hawaii, but it's a planet-wide, 600 mile deep lake. You and everything else, including any organics and any one-celled organisms, would be converted to carbon dioxide and water. Gone." In this scenario, an infusion of organics from elsewhere might be required to ignite life here. The building blocks for life on our planet may have come, at least in part, from asteroids. "Observations by ground-based telescopes suggest that asteroid 1999 RQ36 has a wealth of carbon-based compounds, but we don't know exactly what is there. Are there amino acids? To find out, we need to bring a sample home where we have sophisticated, exquisitely precise instruments, plus the ability to react to new discoveries." Obtaining that sample is a key part of OSIRIS-REx's mission. Upon reaching 1999 RQ36 in 2019, the spacecraft's suite of cameras and instruments will spend a year photographing the asteroid and measuring its surface topography, composition, and thermal emissions while its radio provides mass and gravity field maps. This information will increase our understanding of asteroids as well as help the mission team select the most promising sample site. Like the ancient Egyptian god Osiris, the OSIRIS-REx mission is associated with death as well as life, with both our destiny and our origin. That's because 1999 RQ36 is the Near Earth Object "Most Likely to Succeed" – in affecting our destiny, that is. It has a 1/1800 chance of hitting Earth by the 22nd century. Evidence suggests that a 6-mile wide asteroid smashed into Earth about 65 million years ago, wiping out the dinosaurs and altering the history of life. Instead of dinosaurs prevailing, mammals flourished, evolving into humans. "We're the first species that can mitigate asteroid extinction," notes Drake. "With enough information, we can project the orbit of a threatening asteroid." If researchers can track an NEO's precise path, they can devise a way to nudge the object out of a collision course with Earth. OSIRIS-REx wil help NASA learn to navigate near an asteroid, laying the groundwork for landing on one. That could be pretty tricky, considering asteroids like 1999 RQ36 have so little gravity. "If you simply pushed your finger into the surface, you'd fly off into space, disappear, and never come back!" OSIRIS-REx, however, will hang close, and its cameras will give us window seats to watch its delicate sampling maneuvers. The mission team plans near-live coverage of the operations. But the real action starts, says Drake, when the sample is returned to Earth in 2023. A future story from Science@NASA will explain how the sample will be handled upon return and lay out some of the experiments researchers will do with it. Stay tuned. 1. OSIRIS-Rex is short for Origins-Spectral Interpretation-Resource Identification-Security-Regolith Explorer. Dante Lauretta, Deputy Principal Investigator, came up with the acronym when he was jotting down a list of goals for the mission. "Dante is interested in Egyptian mythology. He was doodling with a pad and pen, and he reached over to show me OSIRIS, and how each letter stood for one of the mission goals. I wasn't' aware of the mythological significance at first. But we'll be taking this prebiotic stuff from the asteroid, chopping it up, and distributing it around the planet for scientists to study where we came from. The mythological figure was also chopped up and distributed." "OSIRIS of Egyptian mythology is the god of life and fertility, the god who taught Egyptians agriculture," said Lauretta, also with the University of Arizona. "There's an analogy to the proposed 21st century space mission. We're looking at the kind of object that we think brought life to Earth; that is, objects that seeded Earth with early biomolecules, the precursors of life." As for the acronym, "O" stands for the scientific theme, origins. "SI" is for spectral interpretation, or taking images of the NEO at wavelengths that will reveal its composition. "RI," or resource identification, is surveying the asteroid for such useful resources as water and metals. "S" stands for security, learning how to predict the detailed motion of Earth-approaching asteroids. 2. In this context, to say that "Earth was sterilized," doesn't mean life was present at the beginning. "There is no evidence for life in the Solar System before the formation of the planets so there was likely nothing to be sterilized," notes astrobiologist Michael New of NASA HQ. It simply means that the heavy bombardment and heating would have sterilized any hypothetical life that might have been present. 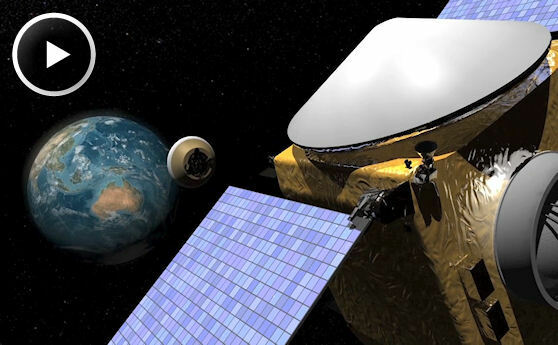 Credits: NASA's Goddard Space Flight Center in Greenbelt, Md., will provide overall mission management, systems engineering, and safety and mission assurance for OSIRIS-REx. Lockheed Martin Space Systems in Denver will build the spacecraft. The OSIRIS-REx payload includes instruments from the University of Arizona, Goddard, Arizona State University in Tempe and the Canadian Space Agency. NASA’s Ames Research Center at Moffett Field, Calif., the Langley Research Center in Hampton Va., and the Jet Propulsion Laboratory in Pasadena, Calif., also are involved. The science team is composed of numerous researchers from universities, private and government agencies. This is the third mission in NASA's New Frontiers Program. The first, New Horizons, was launched in 2006. It will fly by the Pluto-Charon system in July 2015, then target another Kuiper Belt object for study. The second mission, Juno, will launch in August to become the first spacecraft to orbit Jupiter from pole to pole and study the giant planet's atmosphere and interior. NASA's Marshall Space Flight Center in Huntsville, Ala., manages New Frontiers for the agency's Science Mission Directorate in Washington.